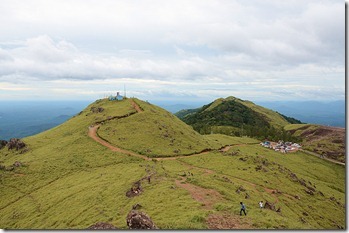 Ponmudi is a very popular hill station located about 60KM from city centre, Thiruvananthapuram district in Kerala. The mountain has a relatively low altitude of 1100m, and it is easily reachable. There is a heavy rush of tourists especially during weekends. 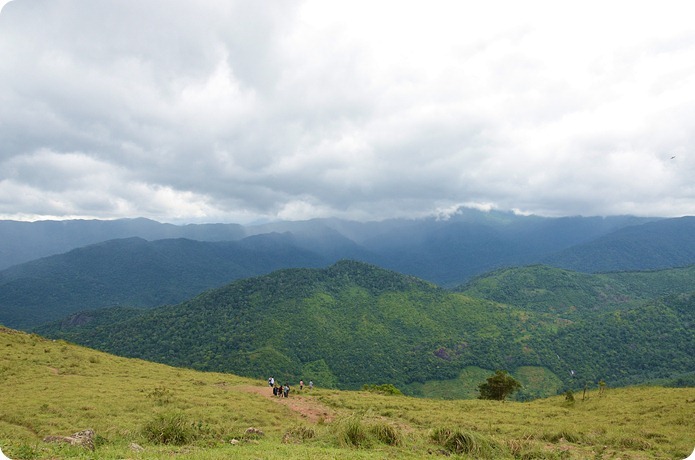 What makes Ponmudi so popular is the easy and unrestricted access to a trekking area with mini mountains and small streams within a radius of around 1KM. There is a reason for unrestricted access – the mountain top is surrounded by roads on all three sides and the other side is protected by vertical cliffs and thick forests. No one will be lost on the mountain top! 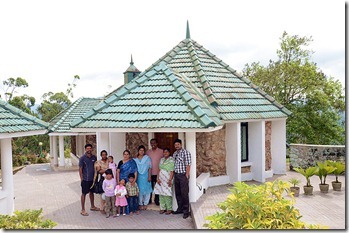 This article is based on my recent visit to Ponmudi KTDC Golden Peak resort. I went there with my family and relatives and spend one night at the resort. 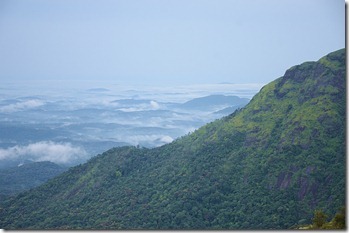 Ponmudi is located on the eastern edge of the western ghats mountain range. On the western side you can see the Agasthyarkoodam Biosphere Reserve (part of Neyyar Wildlife Sanctuary) famous for its medicinal plants. The eastern slope has good forest cover and extends to various estates such as the Braemore estate and the Merchiston estate on the southern side. The northern side of the forest leads to the Thenmala reserve forest in Shenduruny Wildlife Sanctuary. From the topmost point of the Ponmudi peak, you get a fantastic view of the low lying areas of Thiruvananthapuram district on the eastern side. Ponmudi is a Malayalam word and its literal translation could be either "Golden Crown" or "Golden Hair". In olden times, the translation "Golden Crown" seems more natural. 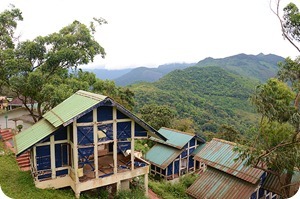 At the Ponmudi mountain top, there are only two places where you can stay overnight. 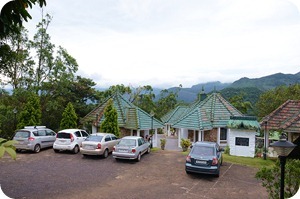 First one is the government guest house which offers breath-taking views of the valley/forest and the second one is the resort operated by KTDC. The guest house rooms are cheap (under Rs.1000 per night per room! ), but getting a room requires you to go through typical government red tape. It requires you to give a written application to the JED political dept. in Kerala secretariat located at the Thiruvananthapuram city centre (that is what I heard, I am not sure about the procedure). 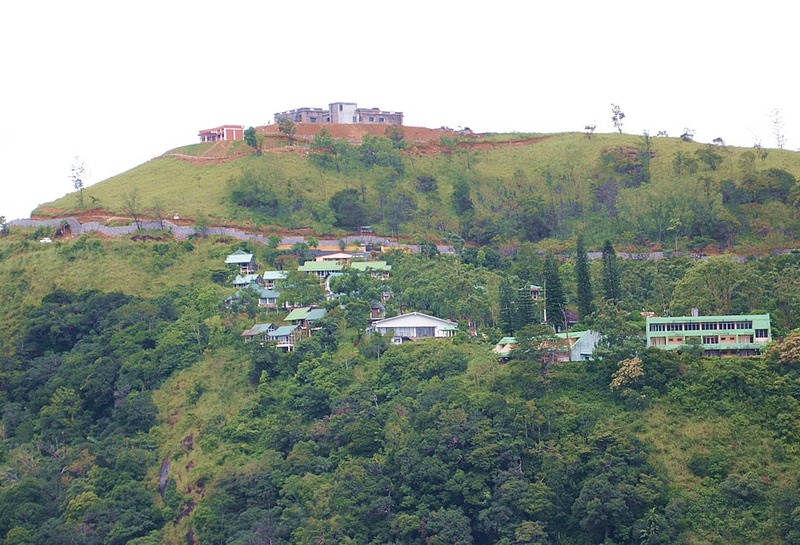 Known as Golden Peak Resort, KTDC resort is located about 2KM away from the mountain top. It is promoted as a budget hotel, but tariff is high (Rs. 2500+ per night). 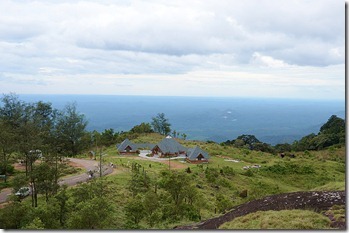 Golden Peak offers panoramic views of the southern mountain ranges leading to Neyyar Wildlife Sanctuary. This article is a detailed review of the KTDC Golden Peak Resort at Ponmudi, Thiruvananthapuram and what you can expect when you stay there. Check out the following map to get a good overview of the Ponmudi peak and the surrounding areas. It is a shame that government gave some of surrounding land to ISRO where heavy construction is on-going for the Indian Institute of Space Science Technology. The virgin beauty of the place will be history within a couple of years. The red lines in the map indicates the main roads. The road from Thiruvananthapuram approaches Ponmudi from the south-western side and then crosses over to the eastern side finally terminating on the northern side. The Ponmudi guest house and golden peak is visible on the eastern side from Hairpin bend 18 on the main road. The first road after Hairpin bend 22, leads to government guest house and police station. The KSRTC bus stand and KTDC Orchid restaurant is also located here. However don’t take the guest house road if you are going to golden peak. There is a separate entrance to KTDC golden peak near the Ponmudi check post manned by Ponmudi VSS. If you are going to upper sanatorium beyond check post, you need to pay Rs.20 per person and Rs.20 per car. 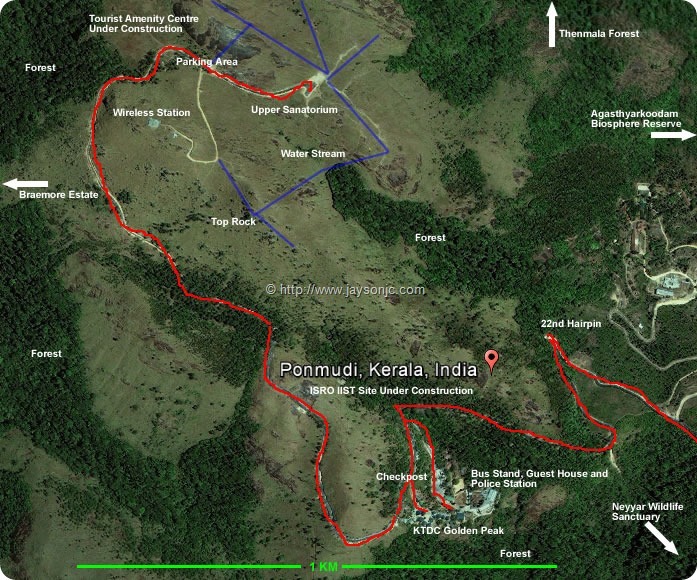 The blue lines in the map indicate the walking trails on the Ponmudi mountain. There is another check post near the parking area on the top. You cannot take vehicles after this place. You can walk along the road to reach the upper sanatorium road end point. As the blue lines indicate, there are many nearby places you can trek to. You can trek to the nearby forest through which a small stream is active during rainy season. You can also trek to the top rock which gives a panoramic view of the valley below and also gives a view of the approach roads on the southern side. Currently it is also possible to trek back to the guest house and KTDC golden peak, however this would be closed once ISRO institute of space technology starts its operation. A new tourist amenity centre (with a restaurant and toilets) is coming up near the parking area on the northern side. The area behind this place extends up to the Thenmala reserve forest. The amenity centre seems good, but is highly inadequate for a tourist place where thousands of tourists visit in a single day! For example, I saw around 5 sitting benches, but instead they should have provided a good pavilion to accommodate at least 200 tourists at a time. There are regular bus services to Ponmudi from the KSRTC city terminus(Thampanoor). Usually buses stop at the Ponmudi police station/bus stand located about 1KM from the mountain top. However some of the buses go up to the top where the road ends! I am not sure about the timings of the bus service to the top, but saw one bus leave the top point at around 4PM. The road to Ponmudi is maintained in good condition and you should be able to cover the distance of 60KM within 2 hours. On the way, there are two main attractions. The Kallar riverside and the trek to Meenmutty waterfalls. Ponmudi VSS (Vana Samrakshana Samithi/Forest Protection Council) manages the parking spot and the bathing spot near the Kallar river. They charge Rs.20 as parking fee. 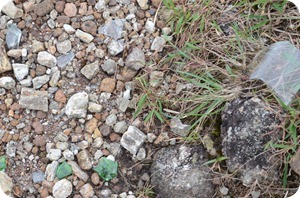 I will be covering these two spots in detail in another blog post. There are 22 hairpin bends on the road to Ponmudi. The road is in good condition, but is narrow. Beware of the speeding vehicles coming downhill as you will driving along the cliff side going up. There aren’t any hotels on the way up after the Kallar Junction located about 12KM from Ponmudi. If you want to do any kind of shopping, the last place to do it would be at the Vithura Junction located about 21KM from Ponmudi. The drive to Ponmudi itself is an experience. You have the beautiful Kallar river flowing on the left of the road and in many places you can park your car and get your feet wet. As you go up, you get beautiful views of the valley and the mountain ranges ahead. Combined with the climate change, it is an interesting experience! Golden Peak is classified as a budget hill resort by KTDC and the daily tariff for the rooms vary from Rs.2500 to Rs.5500 depending on the room type. The property is located on the mountain cliff and offers panoramic views of the valley below. All the cottages are made of wood and granite. All rooms are fitted with geyser and an ordinary television and Airtel DTH connection. Deluxe Rs. 2500+ Can accommodate 2 persons. There are two rooms per building. Cottage Rs. 3800+ Can accommodate 2 persons and additional person on extra amount. This is a completely standalone building, but there is limited private space. Suit Rs. 5000+ Can accommodate 2 persons and 2 additional guests on extra amount. There is a private open balcony available. Unfortunately the location of most of the rooms are not optimal. The abandoned old cottages offer much better view than the new cottages! The cottage rooms are not good enough for the tariff and hence I recommend either deluxe room or the suit room. For the latest tariff, please visit the official Golden peak website. Another problem is that they seems reluctant to book the rooms through phone. When I called, they directed me to book online and said it offers 10% discount! 10% is a nice discount, but in order to book online, you need a credit card. The online booking was easy and there is no offline confirmation of the booking. The rooms are usually offered on the continental plan and hence breakfast is included in the room rent. The breakfast is buffet and is organized in a separate hall in the Orchid restaurant located below. This restaurant is also open to public from the guest house road. For lunch, they don’t give any room service. However for dinner they do offer room service but the staff is reluctant to give this! The buffet breakfast is good and overall the food at the resort was ok. When we visited, the caretaker at the resort was Mr. Dorai and he was very helpful during our stay. Considering that KTDC is a government department, the service was ok. The security staff and the service staff was courteous and the front desk was also ok.
Golden Peak had a small garden with a paved walkway good enough for morning walk which is separated from the guest house road below with a fence. There is also a small badminton court which is also used as a car park! There was an open space in between cottages and the valley and a campfire was arranged here for another tour party which left after 8pm. If you are staying in Golden peak, you can walk to the guest house road through the KTDC Orchid restaurant. The main gate from Golden peak to the road below is closed, possibly due to wandering tourists getting into tourist cottages. The guest house below suffers from the problem of casual tourists as the room guests are disturbed by the tourists who wander around the property. 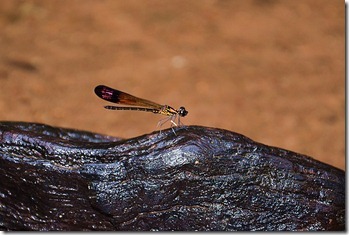 Golden Valley : Kallar River – Golden valley is a bathing spot on the Kallar river managed by Ponmudi VSS unit. 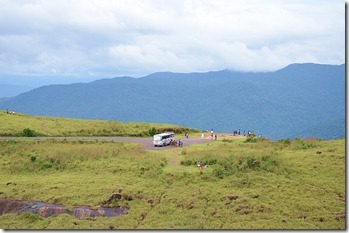 It is located about 12KM from Ponmudi and has a paid parking spot (left side on the way to Ponmudi). Movie cameras are not allowed, I guess due to privacy concerns at a bathing spot! The current fee for parking is Rs.20. I recommend this place for families while Meenmutty is more suited for adventurous folks. 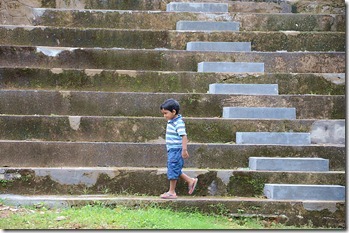 After parking, you need to walk down a set of stone steps to reach the Kallar river. If you plan to bath, I suggest you move upstream a bit. Be very careful with children as the rocks here are extremely slippery. 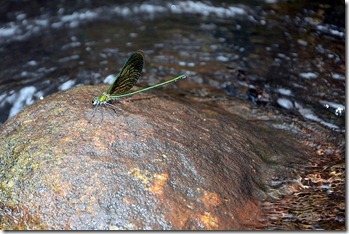 If you are a nature lover, there are plenty of exotic butterflies and dragonflies around this place. Meenmutty Falls – Meenmutty falls is also located near Kallar and you will not miss this place as there is a giant entrance arch on the right side of the road (while driving to Ponmudi). You need to pay the entry fee and then park inside. Then there is a 2KM trek to reach the Meenmutty falls. There are many bathing spots along the way. Peppara Dam – You can go to Peppara Dam taking a right diversion at Theviyode near Vithura (about 20KM from Ponmudi). From this junction, Peppara Dam is located at a distance of about 9KM. The road is deserted and is in bad condition. Please see my earlier blog for more details. There are no private resorts on top of Ponmudi. 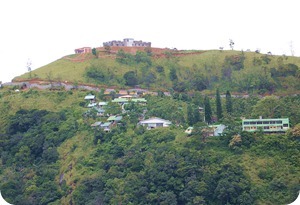 However there are a number of resorts on the valley below near the Kallar river. These are good if you prefer to stay near the river and then visit Ponmudi mountain top during daytime. Dukes Forest Lodge – Please see my earlier blog post for a review of Dukes Forest Lodge. This is located near Vithura at Anappara about 19KM from Ponmudi. River County – I saw this resort near Kallar just before the Meenmutty entrance. This seems to be in a secluded location near Kallar river. If you are going to Ponmudi along with your family, following is my recommended itinerary. 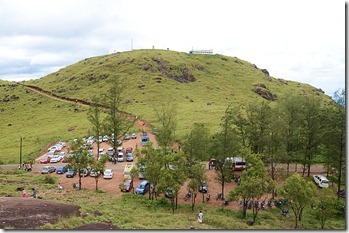 The Meenmutty diversion is optional since it involves around 2KM of trek. 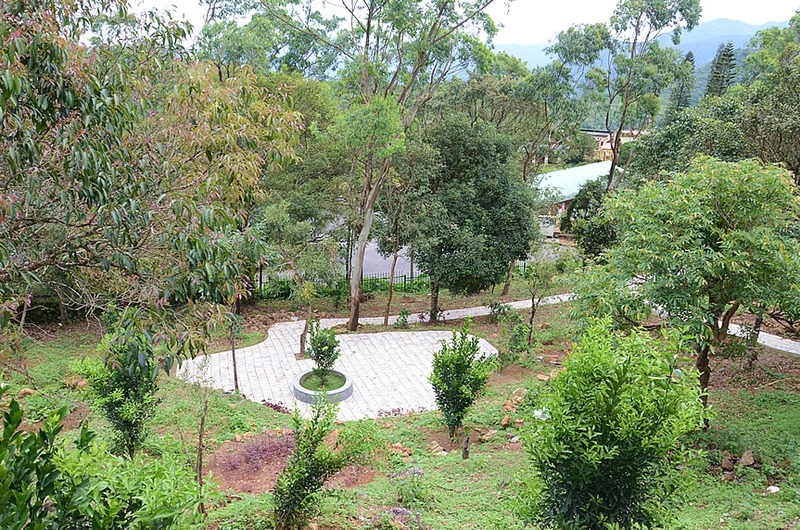 This is a 2 day itinerary including a one day stay at KTDC Golden Peak resort in Ponmudi. Please also refer to the following map. 1 7:45 AM 17 KM You are now near Nedumangad. Drive along the Thenmala road. 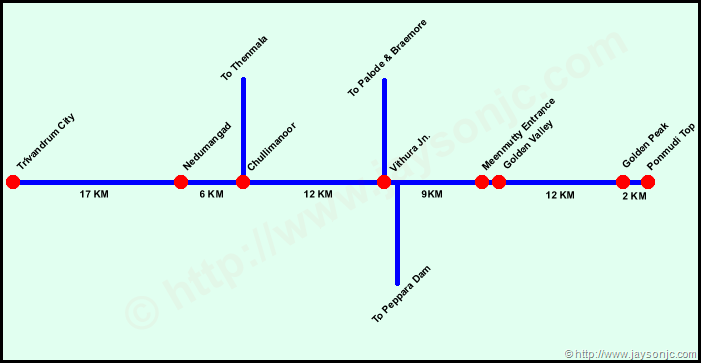 If you take a right diversion, you can go to Nedumangad town. 1 8:00 AM 23 KM Chullimanoor Junction. Take a right turn towards Ponmudi. This junction decides whether you are going to Thenmala or Ponmudi! 1 8:15 AM 35 KM Vithura Jn. Take a right turn towards Ponmudi. This is the last major town before Ponmudi. You can get forest produce such as honey from local shops. 1 8:30 AM 44 KM You have the reached the Kallar river side stop near Golden Valley. Park your car on the left, pay the parking fee and head to the river side. Halt for 3 hours. Time for breakfast and do not litter! Garbage bins are provided near the parking spot. Time for a refreshing bath in ice cool Kallar river! 1 11:30 AM 44 KM Drive to Ponmudi. 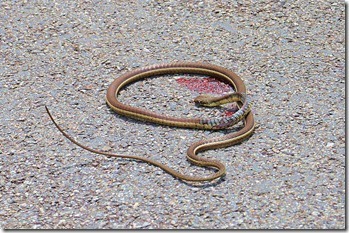 You will be going through thick jungle, however there is little wildlife on this stretch. 1 11:45 AM 56 KM You have reached Ponmudi check post. Pay an entry fee and parking fee here. Rs. 20 per person and Rs.20 per vehicle. 1 11:55 AM 58 KM You are now on Ponmudi upper sanatorium. Park your vehicle and then enjoy the beauty around by taking a stroll along the tar road. The idea is to spend under an hour here before checking in at Golden peak. 1 12:45 PM 58 KM Return from upper sanatorium. Drive till the check post. 1 12:50 PM 61 KM Immediately after the check post, take a sharp right to head to Golden Peak resort. The check post and Golden peak are very close! 1 12:55 PM 61 KM Halt at Golden Peak resort. Check-in and then order your lunch at Hotel Orchid. You have reached 1 hour later than standard check-in time. So your rooms must be ready. Be pro-active in asking the services available at reception. They are very reluctant to open their mouth. 1 2:00 PM 61 KM Walk around the Golden Peak resort. Time to relax! 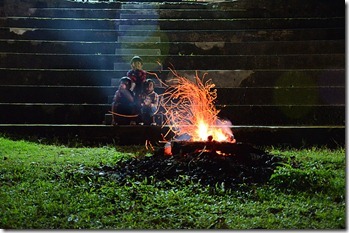 If you want a campfire in the evening, ask at the reception or to the caretaker. 1 4:00 PM 61 KM Tea time at Hotel Orchid. Try French fries and banana fry! Order your dinner at this time. 1 4:10 PM 61 KM Drive to Ponmudi peak You can use the entry tickets you took in the morning at the check post. 1 4:15 PM 63 KM Park & go on a trek. I suggest first to trek to the right and then take a left near the junction which leads to wireless station. Refer to trek routes in the map at the beginning of this article (the blue lines indicate trek routes). Spend time on top till the sun goes down. 1 7:30 PM 66 KM Go for camp fire If it is rainy season, you can hear the sounds of the water streams below. I always fantasize about a leopard hiding a few metres from us! 1 8:30 PM 66 KM Dinner time! There is no way to get alcohol at Ponmudi (carry your own to the resort). Alcohol is prohibited at the mountain top. Room service is available only for dinner. 2 8 AM 66 KM Go to Hotel Orchid for buffet breakfast The breakfast room offers excellent views of the valley below. 2 12:00 PM 66 KM Check out from Golden Peak and have an early lunch. Check out and then go for lunch at Hotel Orchid. 2 12:45 PM 66 KM Drive towards Trivandrum city. Our next destination is Meenmutty falls. 2 1:30 PM 79 KM Reach Meenmutty falls. Spend 2 hours here. Go for another refreshing bath in Kallar! 2 3:30 PM 79 KM Drive toward Trivandrum city. Our next destination is Peppara dam. There aren’t any major attractions in Peppara, other than the dam which is the lifeline of Trivandrum city. For nature lovers, the forest and the lake here is a goldmine! 2 3:40 PM 87 KM Take a left turn towards Peppara dam. Drive to Peppara dam. The road is this route is relatively bad. Enjoy the lonely drive to Peppara! 2 4:00 PM 98 KM Reach Peppara Dam. Park your vehicle outside and take entry pass. The dam entry is managed by water authority. Walk to the dam and over it to the nearby forest. Spend an hour or so. Go for tea & snacks from the shop located on the right side after the main entrance. 2 5:30 PM 98 KM Return from Peppara dam. Head to Trivandrum city. 2 7:30 PM 145 KM Reach Trivandrum city. The travel to Ponmudi and panoramic views from the top are highly enjoyable. Yet there are many things which makes you sad along the trip. The first thing is that there is broken glass everywhere. Broken glass is everywhere near the Kallar river including the bathing place managed by VSS. I had trekked almost all the corners of the Ponmudi top and there isn’t a place where I haven’t found broken glass! I have no problem in tourists having a drink at the top, but what I don’t understand is why they break the glass bottle and then leave the place. VSS is charging Rs. 20 per person and is getting truckloads of money, but doesn’t seem to be interested in cleaning up the place. At least they could have provided some waste bins on the top with a board saying, "Please deposit used bottles here". This would have certainly reduced broken glass menace. If you taking small children to the Kallar river, ensure that they put on the footwear when they enter the river. 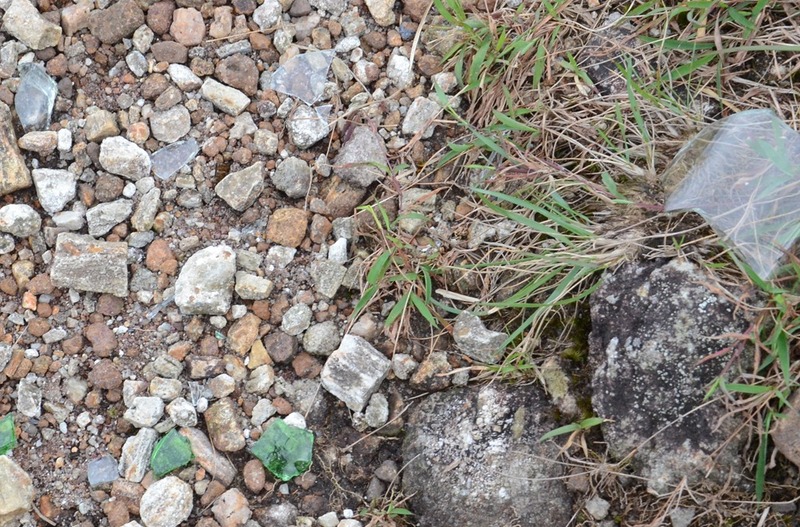 The glass pieces on Ponmudi is not as risky since most of it is harmless, but you never know. It is a colossal blunder to allocate land on the upper sanatorium to ISRO. 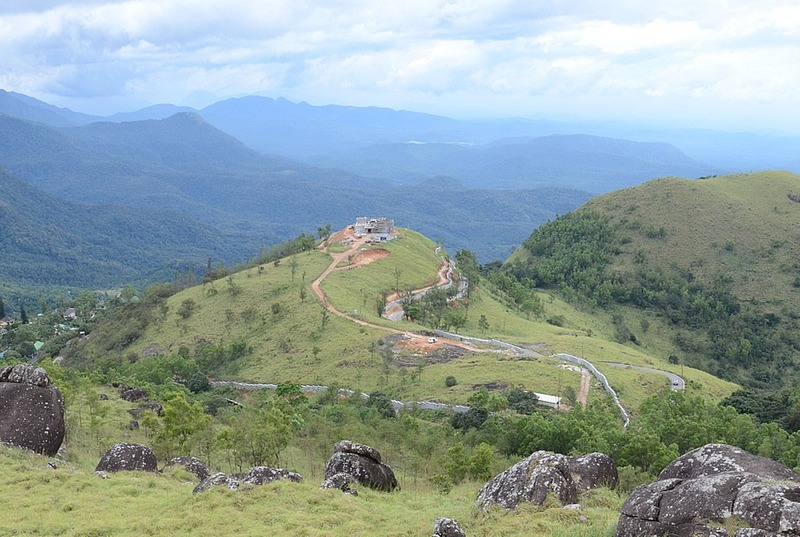 Ponmudi is a well known and popular tourist destination with beautiful views and after construction, the ISRO structures are going to be an eye sore. Our future generations would definitely wonder which idiot made this decision! Even though VSS charges Rs. 20 per person and Rs. 20 per vehicle, they don’t provide any facilities at the mountain top. As usual VSS is run for the employees, not for the tourists. Lack of training is visible as VSS folks seems irritated by tourists! This is usual problem with everything that Kerala government runs. Currently there are no amenities at the mountain top, but a restaurant and a toilet complex is under construction. But this is grossly inadequate considering the number of tourists who visit Ponmudi daily. Talking about Golden Peak resort by KTDC, I have very low expectations it being a government run monopoly at the Ponmudi top. Hence I find it to be ok. The staff seems generally friendly and courteous, but lack of training is all too visible. Compared to the service provided, the tariff is definitely high and when you check-in they provide absolutely no information about the resort or the facilities available. The location of the cottages are a big disappointment. The old, abandoned cottages provide stunning views of the valley, but the resort manager told me that they lost the possession of these cottages (I guess to the forest department who seems to frequently forget that humans also belong to an animal species!). The staff dumps all the garbage generated at the resort in an open space on the valley side. I am not an environmental extremist, but at least they could have covered the garbage dump or created a pit. 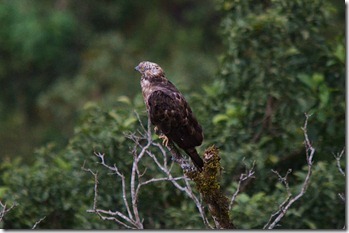 The following is some of the selected photos I have taken during our Golden Peak trip. Hover over the thumbnail for a brief description. Ponmudi and surrounding areas are so well documented! Loved reading this! Was looking for off beat places to visit in Kerala with family and friends. Have bookmarked this blog. It has loads of useful information and is very well presented!